Yesterday's surf action was excellent - as long as whiting was your targeted species. 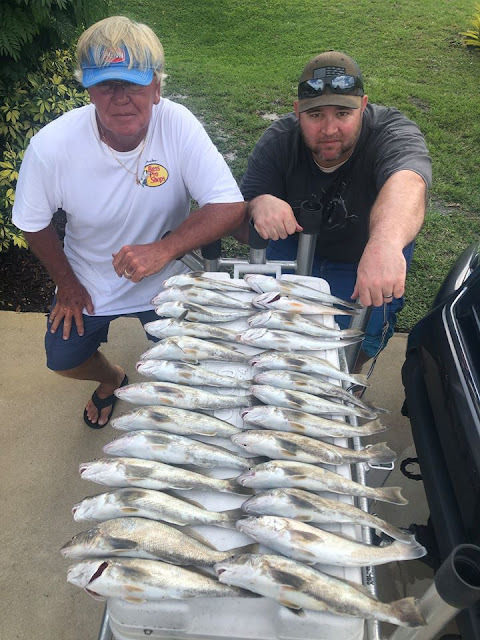 Reports regarding the pompano bite in our local area were not good as a few fish were reported at Tiger Shores and Stuart beach early in the morning. My son Paul and I started at Bathtub Beach at first light and found super clean water and a flat surf. The only bites we got there were from blue runners and bonefish. The bonefish action certainly tells you the water clarity on the bottom is excellent, as this species is always associated with clean water. We moved to Stuart Beach around 8 am and the whiting were there in big numbers. The key to catching them yesterday was casting 70 to 80 yards from shore and having Orange Clam and Pink Shrimp Fishbites on your rigs. The bird activity and bait movement at Stuart yesterday morning was something to see. Spanish Mackerel and bluefish were on those schools at first light, and fishermen targeting them with spoons had great success. It was obvious that they were still present when we arrived, as the first few whiting we hooked ended up bit in half before we could get them to shore. It appears that the usually reliable pompano action in Hobe Sound at this time of year is being affected by the beach replenishment activity occurring up and down Jupiter Island. If you are fishing in the area where the dredge is pumping and the current or wind is pushing all of that dirty water your way, its time to find a new spot. The missing pompano from the last couple of days will show up again - so look for the clean water and you should hook a few. The beauty of area is when one species takes a day off from biting, there is usually another type available to bend your rod.